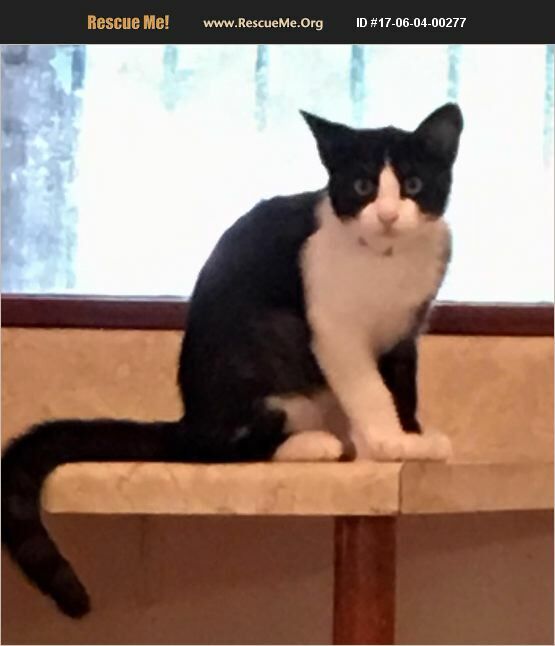 My name is Mikey, and I am a handsome, playful black and white tuxedo dude who was born in February 2017. I love to lay in the window looking at the birds, play with anything that moves, wrestle with my siblings, and snuggle with my foster daddy. He loves me so much, and I cuddle with him at night. He's a Good Samaritan in my book because he rescued my littermates Misha, Tiger, Tish, and me as stray orphan kittens. I am very attached to him because he gave me a much safer environment than the life I would have had fending for myself as a tiny tyke on the streets. Yes, I'm relieved that I've kissed my hardscrabble beginnings good-bye! I'm a little shy with new folks because I've led a pretty sheltered life with only my siblings and foster daddy as company. So I haven't been around a lot of other people or cats and certainly not around any dogs. Therefore, I will need some extra time to adjust to my new forever home, just like it took me awhile to feel secure in my foster home. However, with patience, I assure you that I will become trusting of and feel secure with my forever family, even if they have a gentle dog. Although I can be adopted separately, it would be wonderful if I could be adopted with my twin Misha or one of my tabby-and-white sisters Tiger or Tish. This would make the transition to a new home so much easier -- not to mention that a bonded pair of us would have an instant remedy for boredom while you are away at work or on vacation.Two is always more fun than just one! Think how heartwarming it would be to see us hugging during naps! Won't you consider meeting me and my siblings? We can make your family complete! Mikey is updated on shots, neutered, dewormed, microchipped, FIV/ FeLV negative, and ready for his indoor-only home. No de-clawing permitted. His adoption fee is $125 for kittens 9 months old and younger, cash or check payable to Buster's Friends. Please click the contact button if you are interested in Mikey, and we can let you know exactly where you can meet him. To make the process more efficient, download the adoption application at http://www.bustersfriends.org/catadoptionapplication.shtml. First save and then open it; then you can print it and fill it out.